La Pampa, General Pico, Argentina; 3LIFIA, Informatics School, National University of La Plata, La Plata, Argentina. Received Oct ober 25th, 2011; revised December 1st, 2011; accepted December 12th, 2011.
which incorporate more variability to the system. cations can perform the job. rob ust way dec i sion-making processes. the feasibility of applying the pr o totype in real situations. to satisfy a specific information need in a given context. analysis and results across projects. 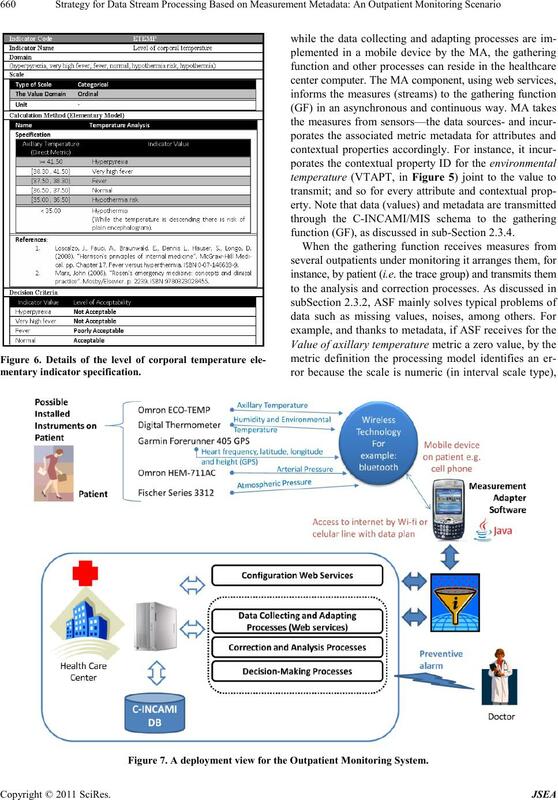 monitoring system for the healthcare domain. 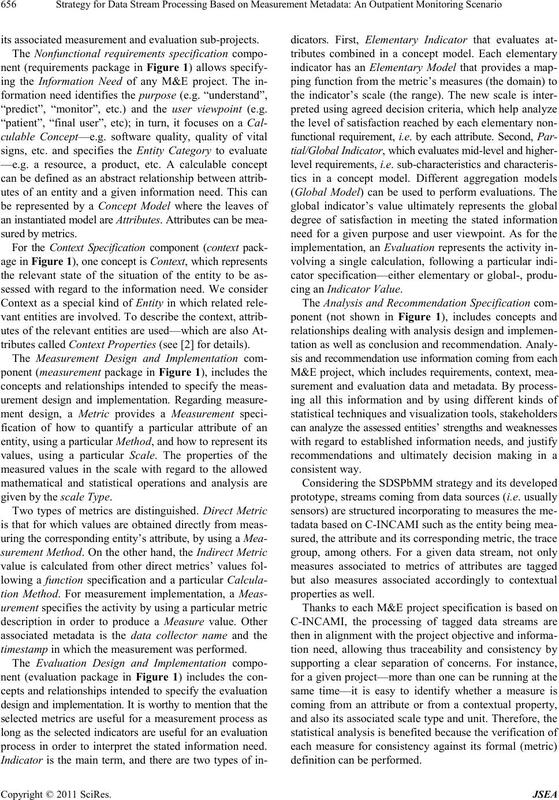 measurement design and implementation, and evaluation design and implementation components. Figure 2. 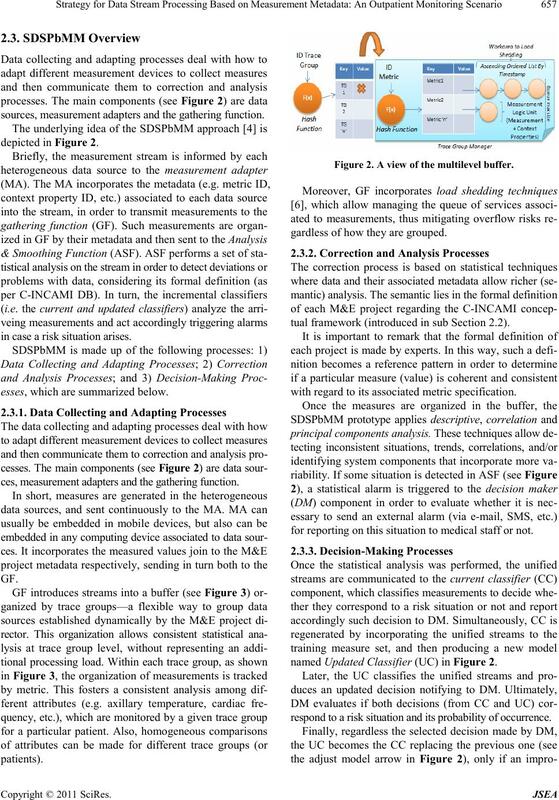 Conceptual schema for the strategy for data stream processing based on measurement metadata. 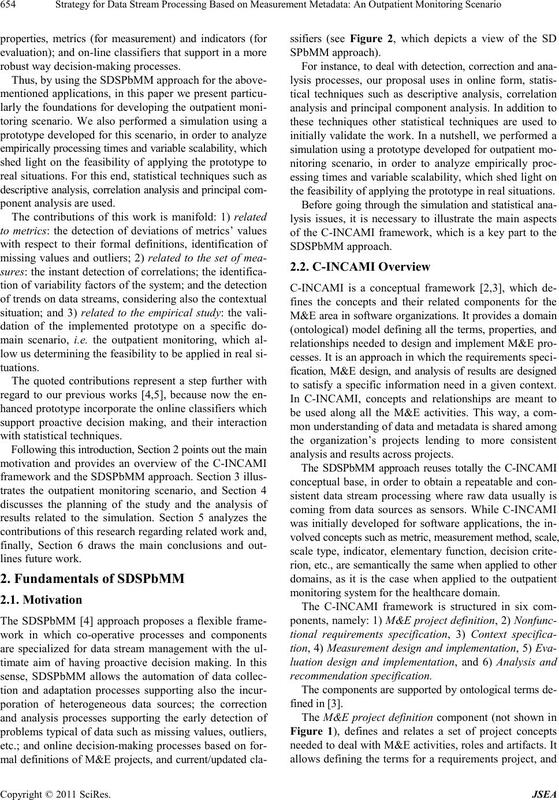 its associated measurement and evaluation sub-projects. 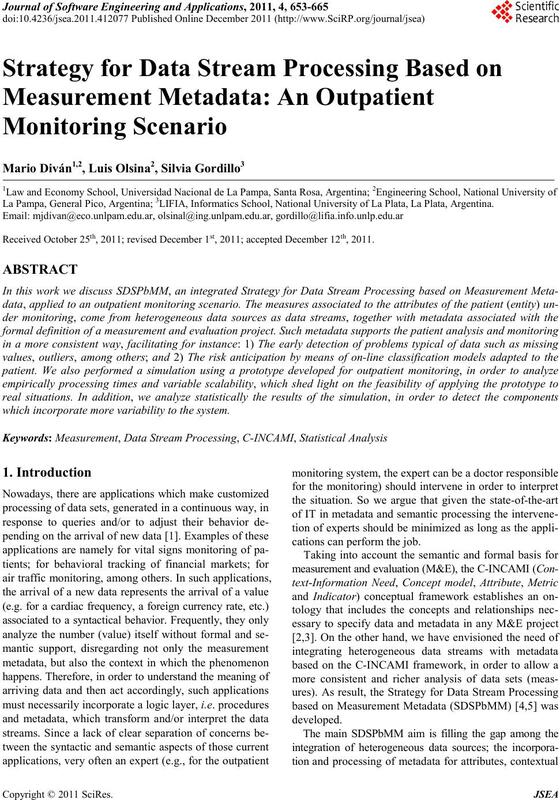 “predict”, “monitor”, etc.) and the user viewpoint (e.g. sured by met rics . tributes called Context Properties (see  for details). given by t he scale Type. timestamp in which the measurement was performed. process in order to interpret the stated information need. 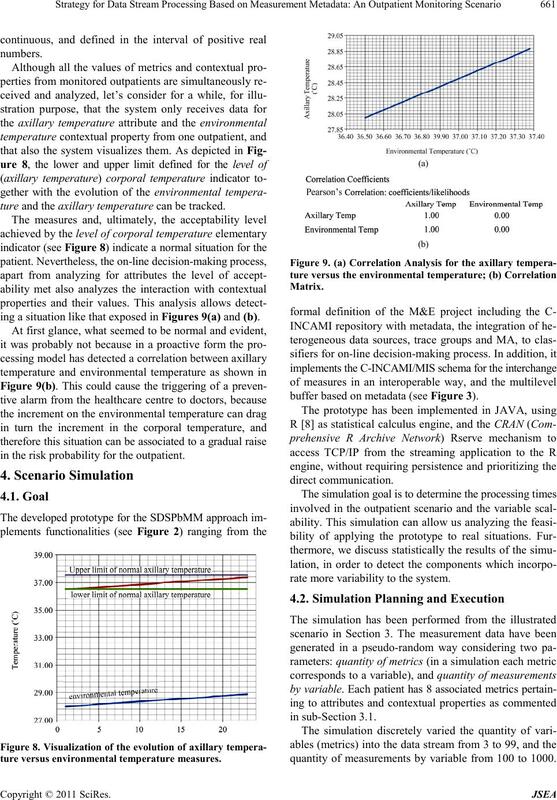 consis t ent wa y.
sources, measurement adapters and the gathering function. in case a risk situation arises. esses, which are summarized below. ces, measurement adapters and the gathering function. Figure 2. A view of the multilevel buffer. gardless of how they are grouped. tual framework (introduced in sub Section 2.2). with regard to its associated metric specification. for reporting on this situation to medical staff or not. named Updated Classifier (UC) in Figure 2.
respond to a risk situation and its probability of occurrence. for each M&E project definition. interoperability, consistency and processability is addressed. such metadata should be embedde d into the stream. Figure 3. 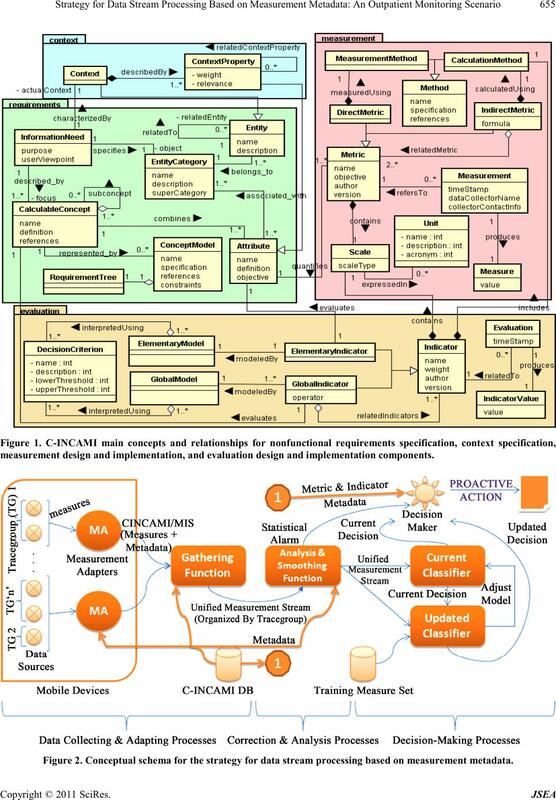 Annotated XML (Extended Markup Language) schema of a C-INCAMI/MIS stream. 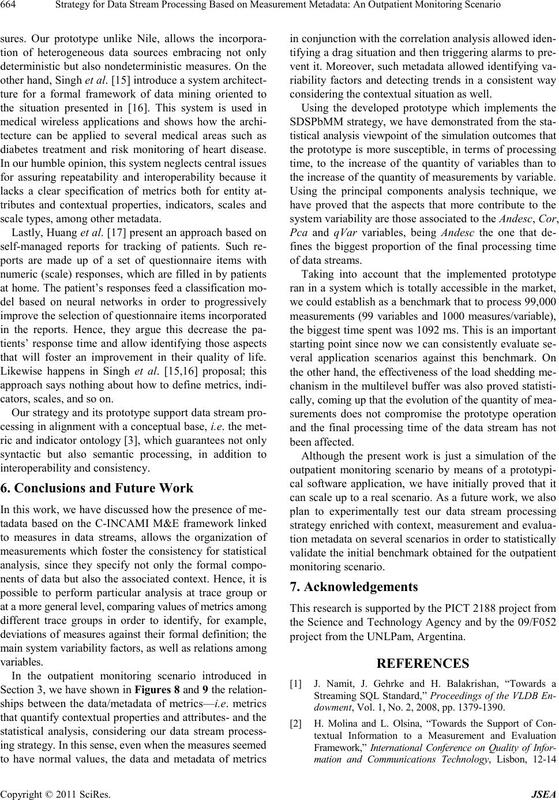 software process t he mea sure? be hampered and the analysis be skewed. tencies in health indicators defined by them (as experts). sociated to the outpatient under monitoring. care centre”. The entity under analysis is the outpatient. ment Design and Implementation component in Figure 1.
toring system considering the SDSPbMM approach. function (GF), as discussed in sub-Section 2.3.4. Figure 7 . 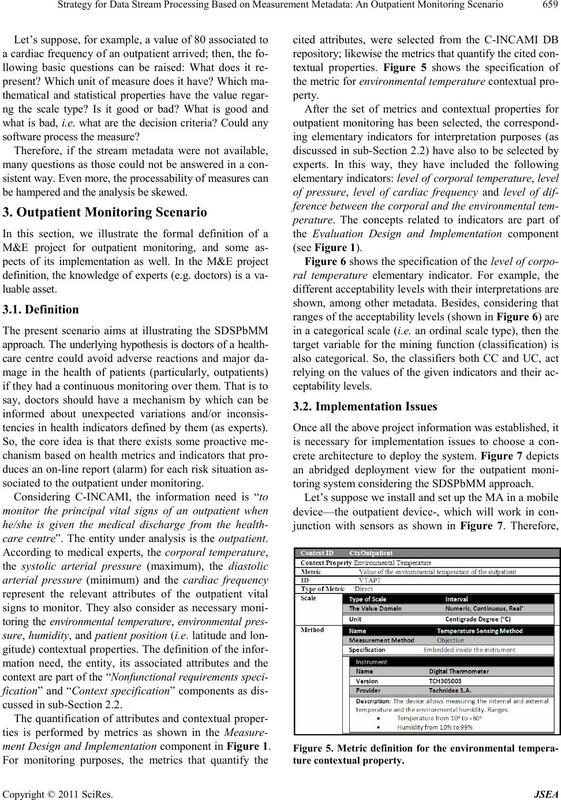 A depl oyme nt view f or the O utpatient Monitoring System. ture and the axillary temperature can be tracked. ing a situation like that exposed in Figures 9(a) and (b). in the risk probability for the outpatient. ture versus e nvironmental temperature measu res. 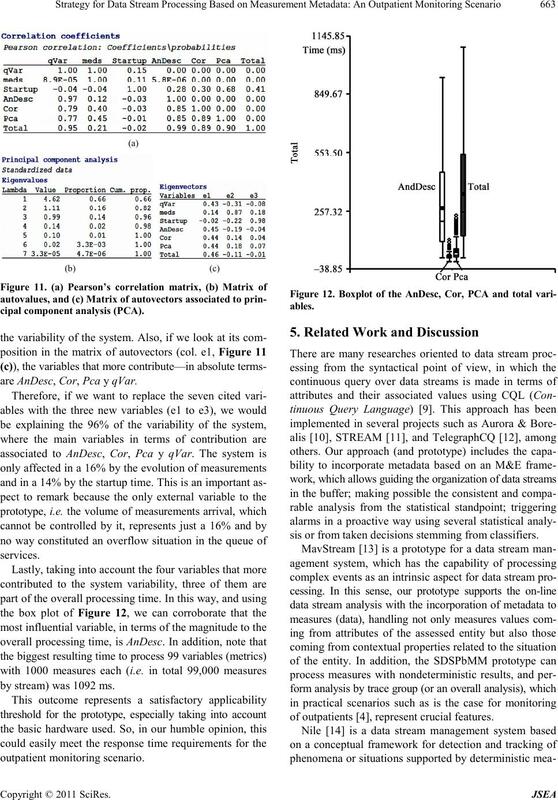 buffer based on metadata (see Figure 3). rate more variability to the system. 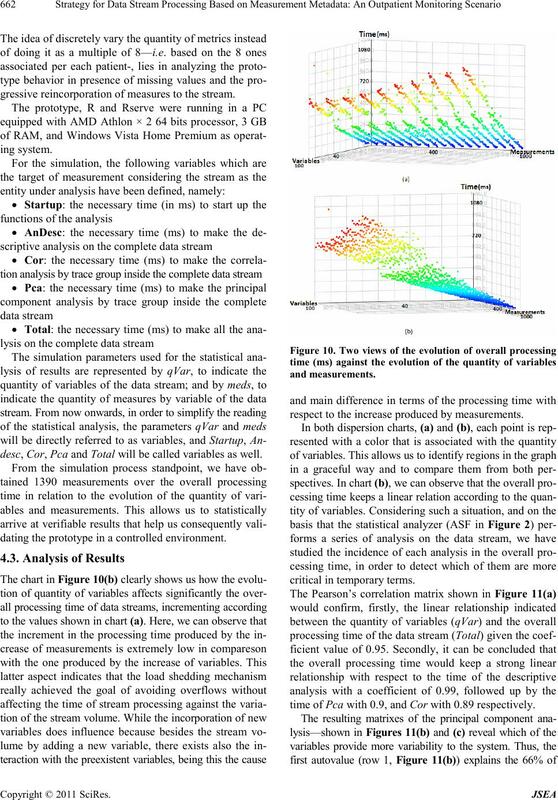 quantity of measurements by variable from 100 to 1000.
gressive reincorporation of measures to the stream. desc, Cor, Pca and Total will be called variables as well. dating the prototype in a controlled environment. respect to the increase produced by measurements. time of Pca with 0.9, and Cor with 0.89 respectively. are AnDesc, Cor, Pca y qVar. by stream) was 1092 ms.
sis or fr om take n decisions stemming from clas sifiers. of outpatients , represent crucial features. diabetes treatment and risk monitoring of heart disease. scale types, among other metadata. that will foster an improvement in their quality of life. cators, scales, and so on. considering the contextual situation as well. the increase of the quantity of measurements by variable. project from the UNLPam, Argentina. dowment, Vol. 1, No. 2, 2008, pp. 1379-1390. Septem be r 2007, pp. 1 54-166. Evaluate Web Applications in a Consistent Way,” In: G.
tions, Sprin ger Book, London , 2008, pp. 385-420. D. Abadi, Y. Ahmad, M. Balazinska, U. Cetintemel, M.
Manager ,” Sta nfor d, 2003.
pande, M. Franklin, J. Hellerstein, W. Hong, S. Madden, F.
No. 2, 2003, pp. 11-18. 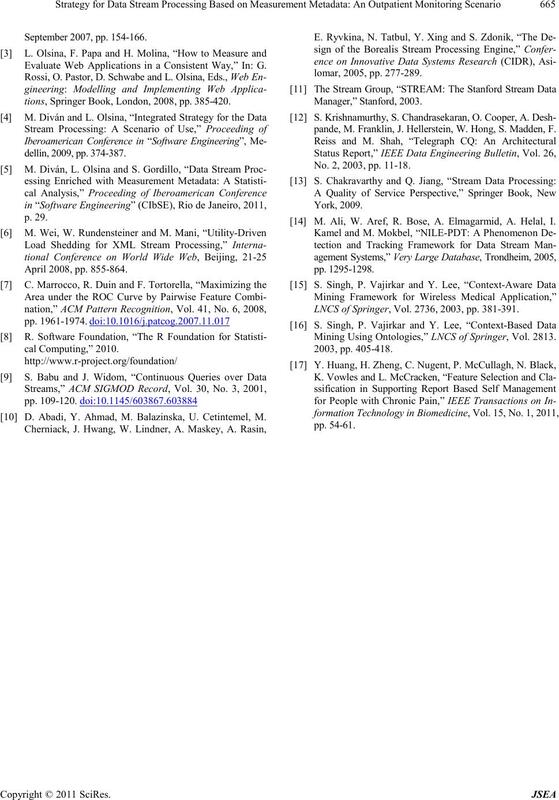 M. Ali, W. Aref, R. Bose, A. Elmagarmid, A. Helal, I.
LNCS of Springer, Vol. 2736, 2 0 03, pp . 381-391. 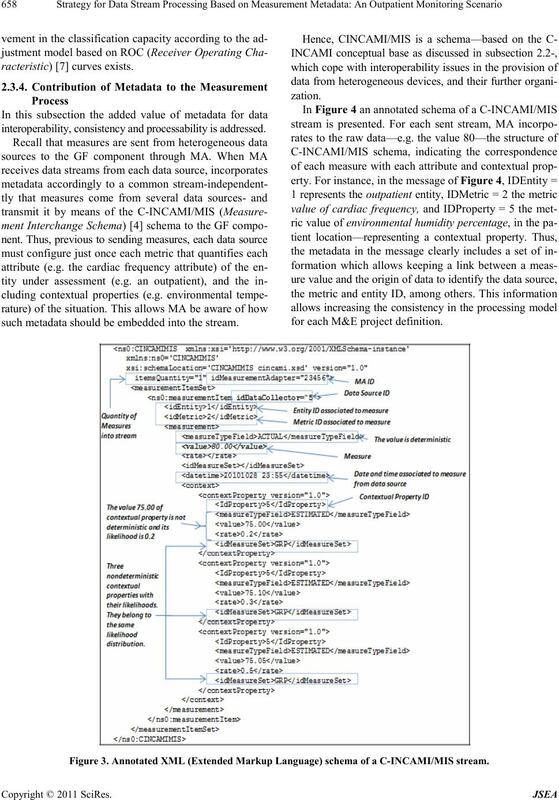 Mining Using Ontologies,” LNCS of Springer, Vol. 2813.